Billericay Town kept their hopes alive of progress to the FA Cup second round with a battling 1-1 draw in Derbyshire against National League opposition, Chesterfield. Going behind to a first half Laurence Maguire header, a wonder strike just after half time from Moses Emmanuel secured a replay at the AGP. On a mild but slightly damp afternoon at the Proact Stadium, all fans briefly united to commemorate Armistice Day and remember all those that lost their lives fighting for their country. The minute of silence was impeccably observed by both sets of fans. 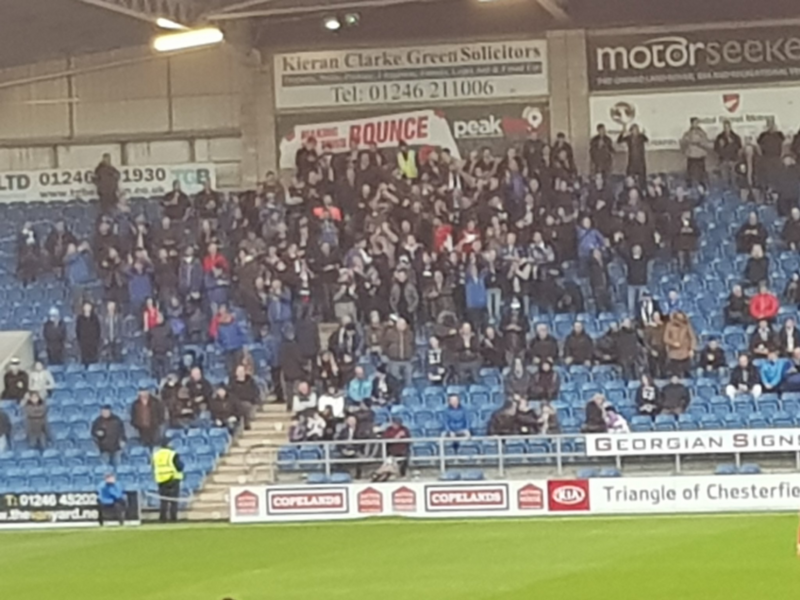 Thereafter, Blues supporters, travelling in numbers, never lost their voices backing the team from the massed ranks in the East Stand. Billericay started encouragingly with a 2nd minute through ball from Jake Robinson serving his strike partner, Emmanuel. In space, the nippy front man sped past the Spireite defence, firing in a low effort at the near post, which brought the first save from opposition goalkeeper, Callum Burton. The home side reacted swiftly, making their superior height advantage tell on several occasions. A series of set plays saw crosses into the Blues box create danger with first warning provided on five minutes by a Maguire header from a corner that saw Alan Julian make the first of a series of saves. With Spireite coach, Allen, bringing second wide-man, Kyel Reid, into the side to add to the threat provided by the tricky Zavon Hines, a clear part of the game-plan was to create chances from wide areas. On 8 minutes, a Hines cross from the right hand side found the head of Marc-Antoine Fortune who could only head straight at Julian. As the game progressed, Chesterfield started to gain an element of control in midfield. Strong pressing in central areas led by the defensive screen of Joe Rowley saw a stray Billericay pass intercepted by Jonathan Smith. He fashioned a chance for the lively Hines who hit a 12th minute shot to the far post that brought a sprawling save from Julian. Blues struggled to retain possession in the face of a physical, but fair, home side. 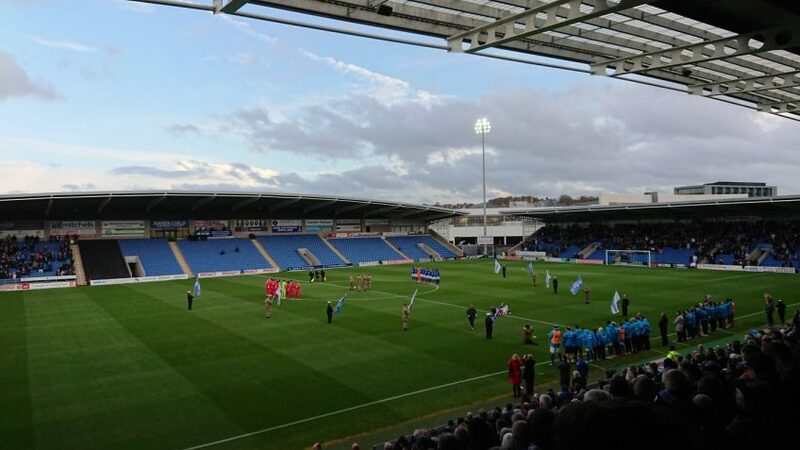 Chesterfield’s performances this season have not been well received by supporters. Not surprising for a town used to League football and, without a win since August 11th, sitting uncomfortably in 19th position in the National League. The men from Derbyshire are not an easy side to play against though and posed problems for Billericay that were a step up from those in the National South. After several warnings, it was foreseeable that Blues would fall behind to a towering header from a cross. Provider, Rowley, put a 17th minute flighted free-kick from the right hand side into the penalty box. Maguire out-jumped everybody to glance a fine header into the bottom corner of the Billericay net. Older brother Harry Maguire, of Leicester City and England, would have been proud of the execution as Chesterfield moved into the ascendancy. With central areas congested, Billericay’s key strength came from exploiting the flanks. First, Joe Kizzi launched a raid on the right side cutting back for Robinson to shoot and force a save from Burton. Jake Howells, who had a strong game in central midfield, linked play intelligently and constantly sought to spread the ball wide. Serving Callum Kennedy, the left back put in a deep cross that fit again Robinson headed just over at the far post. On the half hour, the Blues top scorer would shoot just wide after finding rare space to line up an effort from range. Chesterfield were always dangerous on fast breaks and left back, Will Evans, showed a surprisingly swift burst of speed to force Billericay back. Tracked by Rickie Hayles, he would be stopped but the Blues centre-back aggravated a hamstring injury. After defending another counter minutes later, a disappointed Hayles had to leave the field and was replaced by Dean Inman on 34 minutes. With space at a premium, Billericay play-maker, Sam Deering, was tightly marked. On 38 minutes, the Blues midfielder was able to execute a neat piece of skill to lose the persistent, Rowley, and fire a shot just wide of goal. Town came again through Kizzi who broke free to pull back an inviting cross along the six yard box that rolled just behind the onrushing Ross Lafayette. With half-time approaching, Emmanuel broke free on the left side and was upended on the edge of the penalty area. Although the resulting free kick was fired high and wide by Robinson, the quick break from Emmanuel showed Chesterfield’s vulnerability to pace and provided ample encouragement that Blues could get back into the game in the second half. By the 52nd minute, the visitors were level courtesy of a special strike from Emmanuel. A piece of quick thinking at a swiftly taken free kick from Jake Howells saw the Blues striker with a sight of goal in a central position. From around five yards outside the Spireite box, he hit a powerful shot that curled into the top right hand corner of the goal to restore parity. The equalising strike brought a noticeable increase in intensity to the match as a number of committed but predominantly legitimate tackles rained in. Often comfortable in National South matches, Kizzi was tested defensively to a level not seen before with Jerome Binnon-Williams and Zavon Hines both attacking down his side. As pressure mounted, the outstanding Inman was to the fore, winning countless battles in the air and on the ground as Chesterfield attacked. The home side cranked up the pressure but were met by a wall of Billericay defenders that blocked and tackled desperately to keep the scores level. Scott Doe, quietly efficient all match, pulled off an exceptional goal saving block on 63 minutes as Fortune fired a shot in from close range after a Julian save from Hines. Billericay coach, Dean Brennan, reacted by bringing on ex-Spireite loanee Jamie O’Hara to strengthen midfield in place of Emmanuel. What followed was the most nerve-wracking final 20 minute spell that Blues fans have witnessed for some time as Chesterfield carved out clear chances to win. On 81 minutes, Binnom-Williams wriggled past Kizzi to cut back a ball for Jonathan Smith. Having scored a goal in each of his past three matches, the central midfielder must have thought he would keep the run going. His shot wide from 15 yards with the goal gaping was a very narrow escape for the Blues. Next to try his luck was midfielder, Curtis Weston, with a fine curling strike that finished the wrong side of the far post. Within less than a minute, substitute, Lee Shaw, found himself clear on goal only to be denied by Blues keeper, Julian, racing from his line to pull off a vital save. With four minutes of stoppage time, Julian again found himself called into action saving smartly again from Shaw. 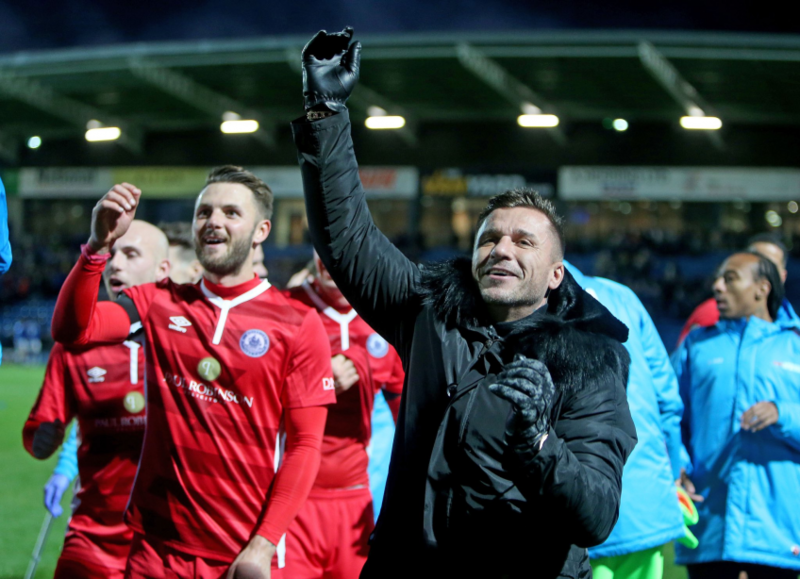 The final whistle brought a sense of pride for a Billericay performance that demonstrated resilience, character, and a determination not to be beaten. As a test for what the National League could bring should the Essex side secure promotion, the visit to Derbyshire ticked all the boxes. Whilst the Spireites do lack the quality of the top sides in the division, the level of organisation and physicality was clearly a step up from what the team has faced hitherto. With Billericay no stranger to replays in the Cup competitions, a big night at the AGP in the week beginning November 19th awaits. The chance to secure a place in the second round of the FA Cup should ensure a big crowd on a special evening. Come on down to the AGP and see the Blues try and make history! “Made a number of vital saves when called upon. His stop late on to prevent Shaw from scoring when clean through ensured we get a replay”. “Posed the Blues defence problems all afternoon. Most creative player on the Chesterfield side and was at the heart of their best moves”.